I’m having so much fun redecorating my house. A few months back, we tackled our master bedroom and now we’re focusing on the living room. It’s been crazy. Not only are we getting new furniture, but we just finished restaining our floors. Today, I wanted to show you some of the pieces that we bought for our living room. I LOVE shopping for new goodies, but I love it – EVEN MORE – when I find great deals. 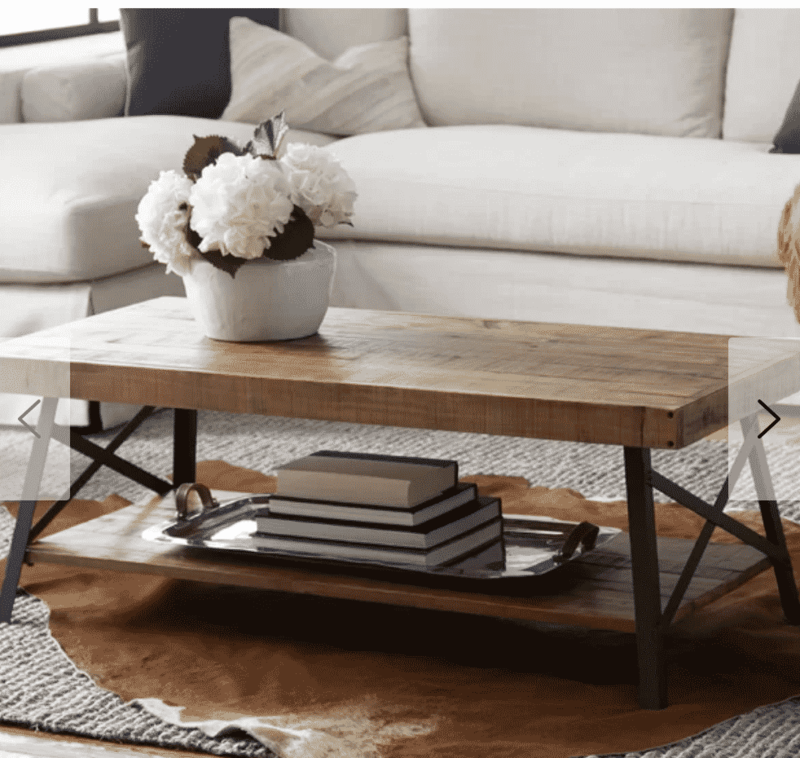 First up, we have the Laguna Coffee table from Wayfair. I fell in love with the simplicity of the design. No more drawers that my children can stuff with empty wrappers and broken crayons. What? Don’t tell me I’m the only one? This table has a “take it or leave it” vibe. No hidden nooks and crannies. I’m over them all! The older I get, the less stuff I want which means I need to have LESS STORAGE for my hoarder family to monopolize. The Laguna Coffee table is coming on Wednesday! I cannot wait. Can you hear me screaming?! Also as a heads up, if you use eBates, I think you get a percentage of your sale back?? Click here to sign up. If you do, we both get a little bonus. This is a terrible photo from Bob’s – but here is the couch that we decided on. We really wanted a sectional because… with two teens and my husband, someone is always on the freaking floor. My family cannot FIT during family night. Time for an upgrade. This Hamptons Sectional not a TRUE white. I will update this picture once we get it into our house (tomorrow). 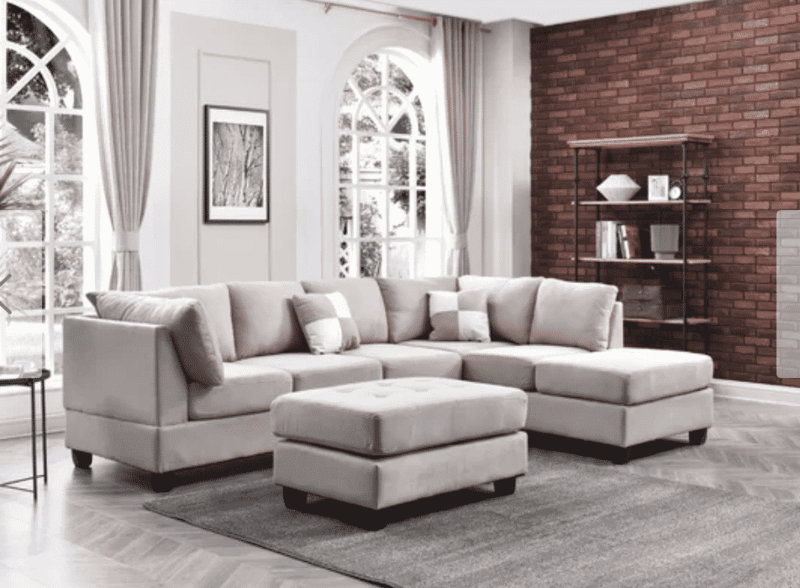 The Hamptons Sectional is BIG and even comes with a gorgeous chair which we bought and returned because we realized that we didn’t have the space to house it all. To be honest with you, I was also toying with getting this couch – it’s a little bit smaller and I think it’s cheaper. But in the end, we went with the larger option for SIZE reason alone. If you don’t need THAT MUCH COUCH, then check out the above. Onto the small stuff!!! I picked up several pieces from Target last night while I was supposed to just be grabbing my migraine medication. But we all know how that goes. Walk in with a list of two things and come out with 25. Why does Target do me like that? I can’t really get much more until the actual furniture is placed in my house – ready to rock and roll. We also need new carpets. But since we JUST did our floors, we aren’t allowed to put anything down for another two weeks. So, I’m holding until we can place them. There is NO POINT in doing all of this and then having to figure out where to store HUGE RUGS if I don’t have to, right? In the end, I am super excited about it all. Stay tuned for more updates. A lot is going on this week. I can’t wait to show you the after. The style I am going for is called “natural living room” on Pinterest. At least, that’s what I look up when I search for inspiration. 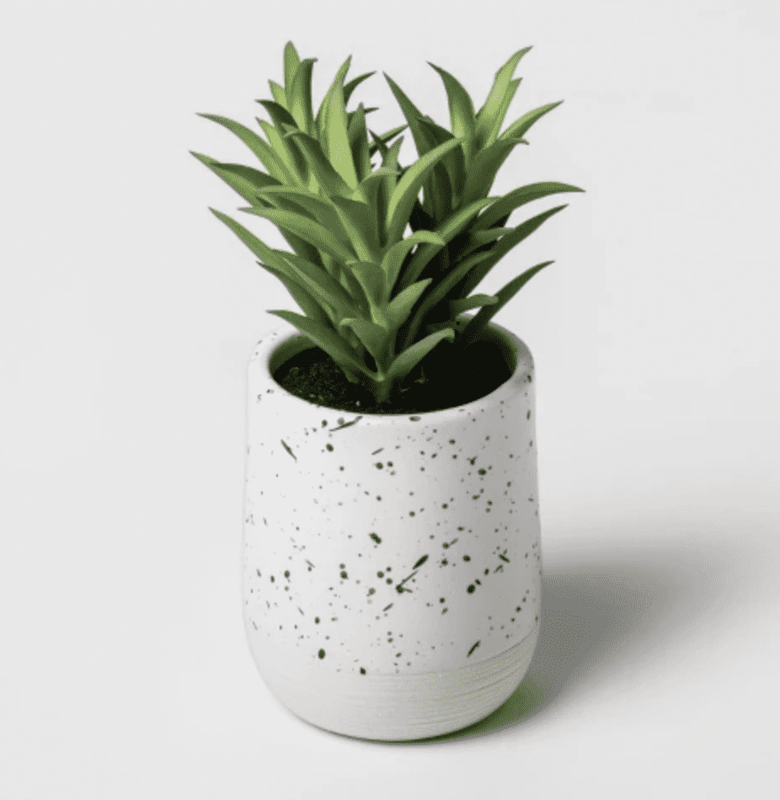 So, there will be a lot of natural elements like wood, plants (ok, fake plants), marble, cement, steel – etc. It will all ground that white couch. Very neutral. The colors will pop based on my accessories but the majority will truly just be black, brown, white, and green. I don’t think we are going beyond that color ppalettewith this home decoration plan. I am going to need a few weeks to get the rugs in and then once that is all put together, I will show you the final look with all links so you can see how much I spent and where I spent it. I AM SO EXCITED OMG EEK! I am in love with your choices!!! 3 years ago we were gifted a beautiful off-white couch and sofa set when we moved into our new home. the end. We threw it out this January because 4 kids, a massive dog, a cat, a rabbit, and numerous teenagers visit my home. The next set I have been dreaming of is a huge sectional like the one you pictured above!!! I can’t wait to see the finished look!!! I’m loving these updates. They look really chic and pretty.